Whether you’re totally new to smartphone photography or a seasoned pro, you might have heard about DJI’s handheld smartphone stabilizer, the Osmo Mobile. Although DJI might be known for its drones, the company makes outstanding camera gimbals, that can seriously improve the way you shoot videos on your phone. And now, to kickstart CES 2018, DJI is introducing a new version of its smartphone stabilizer called DJI Osmo Mobile 2. Right off the bat, it is worth noting that the Osmo Mobile 2 is only a slight improvement from the original stabilizer. The biggest change with the Osmo Mobile 2 vs. the original one is the price. The Osmo Mobile 2 will cost $129 which is much more affordable than the previous iteration that costs $299. 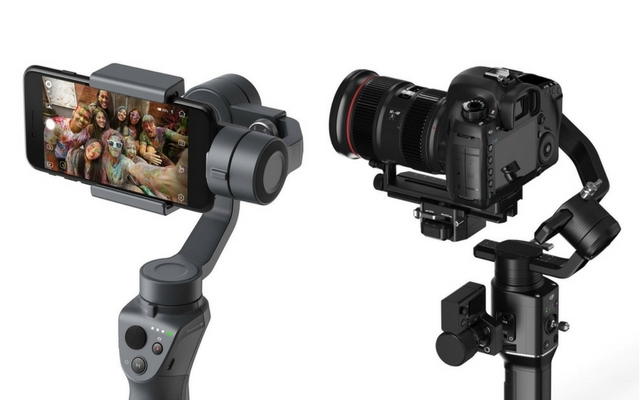 In addition to Osmo Mobile 2, the company has also launched its first single-handed stabilizer for bigger cameras called Ronin S. With this new offering; the company is looking to compete with other companies like FeyuTech and Zhiyun in the compact 3-axis DSLR gimbal market. In terms of the functionality, there’s only one big notable change in the new Osmo Mobile 2, which now supports Portrait orientation. With the growing popularity of ‘Stories’ format across most social media platforms, this isn’t a surprising change. And in case you’re wondering, the original model could shoot in portrait too; but you had to maneuver the stabilizer sideways for that, which wasn’t always ideal. Thanks to all-plastic construction, the DJI Osmo Mobile 2 is lighter than the predecessor as well. The company has also tweaked the button layout, making it more simple to use the gimbal. And lastly, DJI has ditched user-removable batteries in favor of internal batteries, but the company claims that the new model is supposed to last upto 15 hours on a single charge. Well, if you’re interested in picking one up for yourself, the Osmo Mobile 2 will initially be available for preorder exclusively through Apple starting on January 23 and it will go on sale starting next month. But if you don’t want to wait, you can check out our picks for best gimbals here. The Ronin S looks identical to Osmo Mobile; however, it’s designed to accommodate DSLR and mirrorless cameras. But unlike Osmo Mobile 2, the Ronin S houses complex controls which directly allows you manipulate camera functions. And yes, it also has powerful motors so that it can handle the extra weight of cameras. DJI is yet to announce the pricing of Ronin S, but it will be available in Q2 2018.